is available in the web site Tarot of Marseilles Heritage, created by the present author in partnership with Yves Reynaud. To purchase the other items, please contact the author. complete with the 56 minor Arcana and the 22 finlaized major Arcana. 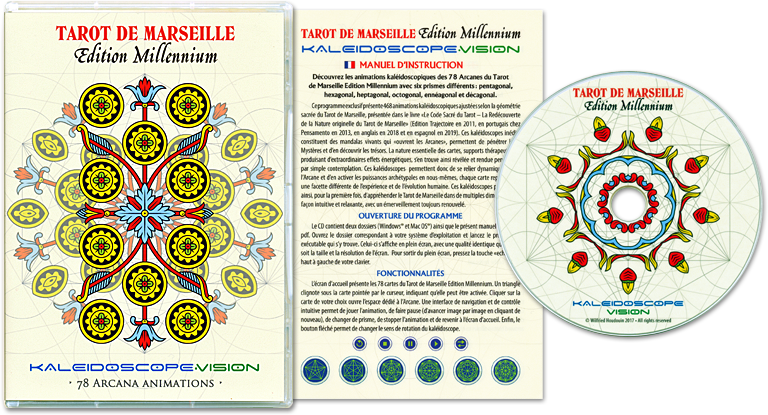 The regeneration of the 22 Major Arcana of the Tarot of Marseilles, based on the rediscovery of their original geometrical structure. Crafted in Marseilles with the utmost respect for the traditional canon of the historical Tarot decks of reference, published in 2011. Accompanied with a 44-page booklet. Signature and dedication on inquiry. To make your order , contact the author. The rediscovery of the original nature of the Tarot of Marseille, philosophic instrument par excellence expressing the « game of the government of the World » common to all the Humanity. Contains more than 200 illustrations all in colors. with six different prisms : pentagonal, hexagonal, heptagonal, octagonal, enneagonal and decagonal. and to discover their treasures. The essential nature of the cards is so revealed and made perceptible by plain contemplation. Compatible Windows® & Mac OS®. Instruction manual in French English and Spanish.